In mid-June, we were delighted to welcome Communication Manager, Maree Butterworth to our factory in South Vietnam. As the company celebrates its 20-year anniversary next year, Maree has been tasked with writing a book on the company’s history. 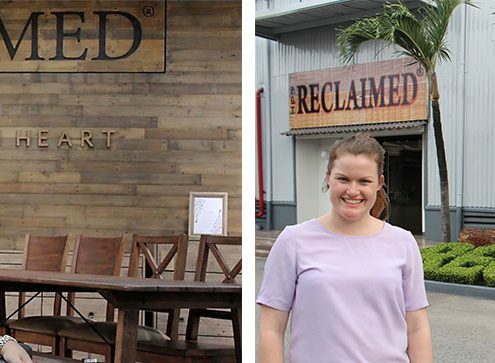 In this first blog edition, we asked Maree to tell us about her trip to Vietnam and what she discovered about PGT-Reclaimed. Spending a few solid days onsite with a client is a rare privilege, but it is the perfect opportunity to experience first-hand the inner-workings of the business and gain a strong understanding of what has driven its success. When I arrived at the PGT-Reclaimed factory, situated approximately 45 minutes from the bustling city of Ho Chi Minh in South Vietnam, it quickly became apparent the factory was the heart and soul of the company founded by Australian man, Ian Burden, almost 20-years ago. Driving through the gates of this impressive site, I had surreal feeling having only previously seen images of the factory. Now I would see it all in person, including meeting some of the 700 team members that work to create the stunning handmade 100% reclaimed wood furniture. A Prized Experience at PGT-Reclaimed! It’s not often you get to see where your new bedroom suite was made and meet some of the 700 hands behind the stunningly crafted furniture! 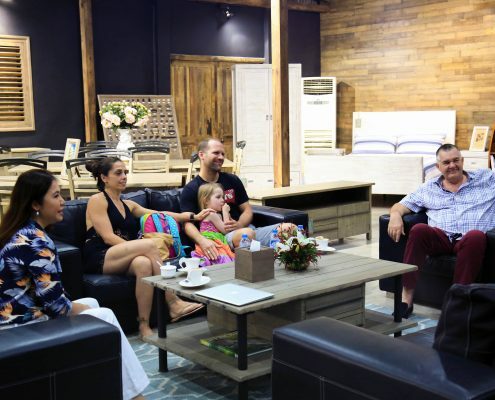 In June, James Vine who won our ‘Win a trip to Vietnam’ competition got to do just that, taking his wife Ana and daughter, Jasmine, on an adventure to discover the PGT-Reclaimed factory, while also absorbing the local Vietnamese culture. The young family from Frenchs Forest, New South Wales, enjoyed a luxurious stay at Hotel Majestic, at the centre of Ho Chi Minh City, in South Vietnam. They explored the Vietnamese icons of the Mekong Delta and historic Cu Chi Tunnels, with the highlight of the trip a rare glimpse inside the PGT-Reclaimed finishing factory about 45 minutes from the city. James said he felt very privileged to win the competition and prize. https://www.pgt-reclaimed.com.au/wp-content/uploads/competition-winners.jpg 3840 5760 shm@rk https://www.pgt-reclaimed.com.au/wp-content/uploads/20-years-logo-1.png shm@rk2017-06-14 15:31:022017-07-20 16:57:08A Prized Experience at PGT-Reclaimed!